Natural Raffia Trim Deck Fringe Grass Decoration is an attractive addition to your Jungle Safari Black Panther Theme Luau party at an affordable price that keeps your check book as happy as your Luau guests. No Luau party is complete unless everything is decorated. Authentic island theme decor can change any area into a tropical paradise! 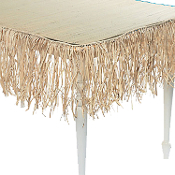 Tiki bar deck fringe can trim table, bar, window sill, railing, doors, ceilings, and just about anywhere else you need it! Border a room, use as bed or table skirting, decorate your own Tiki Bar! Spice up the Party Location with Natural Raffia Trim! -Natural tan color of this Hawaiian Tahitian-style fringe will complement any pool or beach party island or pirate theme. -Made of genuine, authentic, natural raffia. A must have Hawaiian accessory for tropical theme events like Hawaiian Luaus, corporate parties, weddings and more. Raffia is a type of fiber that comes from the Raffia Palm Tree of Madagascar. The Raffia Palm (Raphia farinifera or R. ruffia) has leaves that can grow as large as 60' long. Each leaf is made of a 100 leaflets that can be broken apart and used in many products, like hula skirts. The raffia fiber is soft, pliable, and strong. *Remember, this is a natural, handcrafted product, which may vary from batch to batch in shade and thickness. Please keep this in mind when ordering.